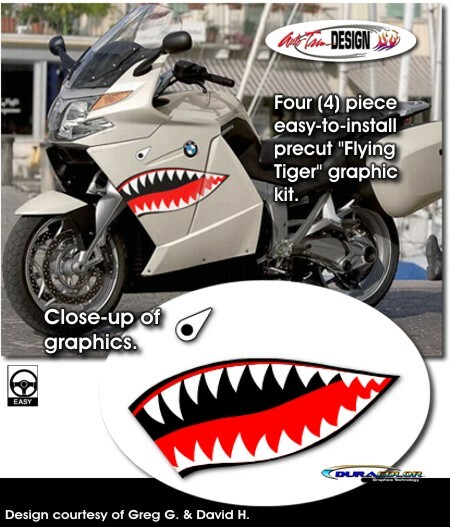 Turn heads and have fun with this nostalgic P-40 Flying Tiger Shark Teeth four (4) piece easy-to-install Graphic kit. Created specifically for '06-Current BMW K 1200/1300 GT bikes, this kit will set your bike apart from the rest in no time. The DuraCOLOR manufacturing process for this item features two (2) colors (Red and Black) printed on White. Moreover, the graphics are covered with a 2 mil clear laminate which will protect the graphics from miles of abuse.